Insatiable Salivation was the first play that Mike and Ken wrote together. Most of the writing took place at Mike's home in the woods of Soquel, California. The date and time of the performance had been scheduled before the writing of this play. Though they had confidence, certain stresses started arising when 3 weeks before opening night, they still had not begun writing. 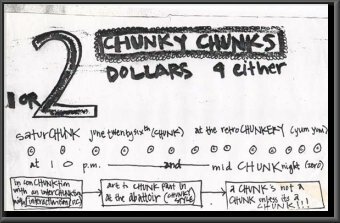 Finally, with eighteen days to go, in a haze of marijuana , vitamin C, coffee and other MINDBENDING substances, they wrote Insatiable Salivation in one 4 or 5 hour spurt in the middle of the night. This would set the tone for the first 4 productions. 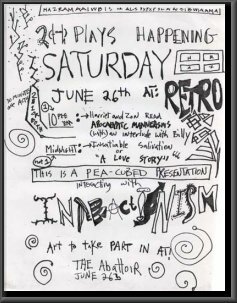 One night of writing, no editing, crash and burn style production, and handdrawn flyers (Ken, Amy, and Mike each made one for this first performance. They appear later on this page.) For all the amateurish aspects of their troupe, they generally managed to put on a show that was at least extremely entertaining and thought provoking, after all, at this stage they were amateurs. Insatiable Salivation is the story of one Satan's confession with one Priest. It is the story of religion. Of belief and of disbelief. A story of power and lust and greed. In Insatiable Salivation, a Priest's earthly desires become entangled with his spiritual existence and Satan is the only supernatural being who can provide a way out. On the flipside, it is only the Priest whose overall desire for good and incomprehension for guiltfree evil can set Satan free. It is a mutually doomed relationship and deception and murder are the portals to a new reality for the pair. Insatiable Salivation was performed in June of 1993 at the Retro Cafe in Santa Cruz, California. Truly the manager of the Retro and the owner were responsible for providing the impetus for Pea QQQ'bd to get off the ground. They were offered the space to do a play after they had done a reading from their literary production, McZeen. 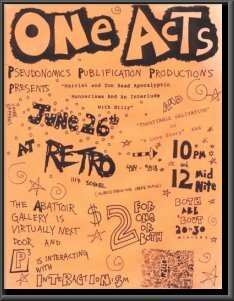 Thrilled to be invited to perform further their, they set a date and performed IS and Harriet And Zon Read Apocalyptic Mannerisms With An Interlude With Billy, on the same night that another art ensemble, The Interactionists, were performing two doors down at The Abattoir. The two groups timed their performances around each other and were able to mostly share crowds. One goal P3 had was to tear down the fourth wall. To bring the audience beyond the audience level and let them in on the secret. Multiple times in the play, the masks of character were brought down and unexpected ,outside of plot, events took place. Pushing the envelope was important to this theatre group. As they would continue to do more and more in the coming productions.